This study reports on the 5-year biochemical-relapse free survival (bRFS), and late gastrointestinal (GI) and genitourinary (GU) toxicities of patients who underwent a prostatectomy and received high dose (> 72 Gy) radiation therapy with an absorbable polyethylene glycol (PEG) rectal spacer implant. From January 2010 to October 2013, 21 radical prostatectomy patients received a PEG spacer. GI and GU toxicities were scored using the National Cancer Center Institute Common Terminology Criteria for Adverse Events v4.0 grading scheme. bRFS was tallied and segregated into risk groups according to the National Cancer Comprehensive Network (NCCN) guidelines version 1.2016. Cox regression multivariate analysis was performed to elicit disease risk factors. The mean follow-up time was 59 months (SD 12, range 40–97). Our GI toxicities for acute, 3 months, and after 6 months are as follows: grade 0 (57%, 86%, 86%), grade 1 (43%, 14%, 14%), and grade 2 (0%, 0%, 5%). Our GU toxicities for acute, 3 months, and after 6 months are as follows: grade 0 (43%, 48%, 62%), grade 1 (48%, 43%, 24%), and grade 2 (10%, 5%, 14%). There were no late grade 3 GI/GU toxicities. The 5-year overall bRFS rate was 62.2% (95% CI 42.6–90.9%, SE 12.0%). Multivariate logistic regression analysis revealed positive surgical resection margins to be predictive (p = 0.00037) for decreased biochemical control. Hydrogel rectal spacer implants in patients who previously had a prostatectomy is well tolerated long term with reduced incidence of GI and GU toxicities, and bRFS rates consistent with previous reports in the literature. Brandon M. Lehrich and H. Michael Moyses contributed equally to this work. 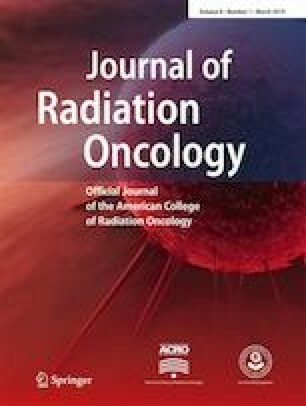 A portion of this study was presented at The American Society for Radiation Oncology 58th Annual Meeting, September 25–28, 2016, Boston, MA, USA. (i) Conception and design: BML, HMM, KT; (ii) administrative support: HMM, KT; (iii) provision of study materials or patients: HMM, KT; (iv) collection and assembly of data: BML, HMM, LB, AM; (v) data analysis and interpretation: BML, HMM, LB, AM, KT; (vi) manuscript writing—original draft: BML; (vii) final approval of manuscript: all authors. A portion of the study was funded by the Medici Foundation (non-profit organization).